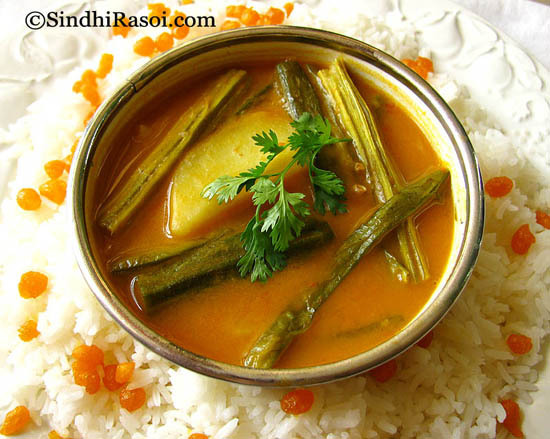 Kadhi Chaawaran or Sindhi Kadhi with rice is the most favorite dish of majority of Sindhis. 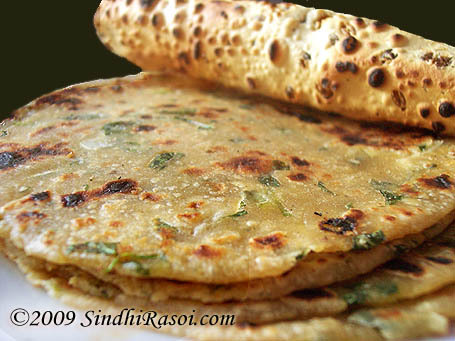 Easy to cook, could be easily cooked in large quantities, which means its ideal for serving to guests at home. 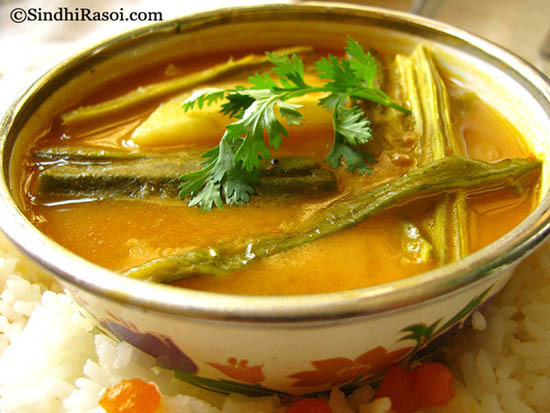 The tangy gram flour based curry, with lots of assorted vegetables is loved by one and all. The kadhi tastes best with steamed white rice, crisp double fried potatoes and sweet boondi. In pressure cooker heat 2 tbsp.of oil and add curry leaves, mustard seeds, cumin seeds, fenugreek seeds and let the seeds splutter. Add gram flour and cook it on low flame while stirring constantly. When the flour turns brown in colour (watch out, or else it might just burn) add red chili powder and then add grated tomatoes and keep mixing. Add some water, while stirring, to avoid any lumps. But be careful as it splutters a lot at this stage. Add turmeric powder, ginger, green chilies and salt, place the lid of the pressure cooker, close it and wait for a whistle and then simmer it for 10 minutes minimum, under pressure. Add all the vegetables (except okra) and close the lid of pressure cooker and wait for one whistle of cooker. Finally add slightly fried okra, tamarind pulp, coriander leaves and simmer for 2 min. Serve hot with plain white rice, aloo took (crisp deep fried potatoes) and sweet boondi. 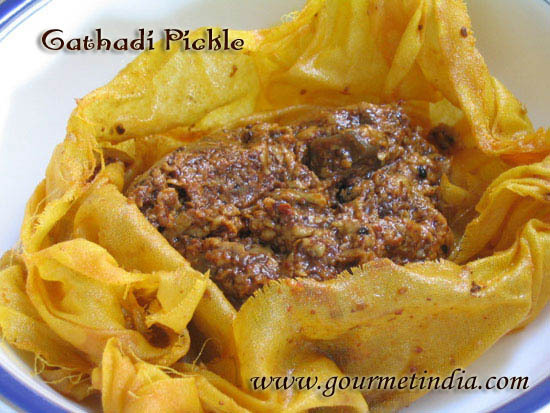 Can this khadi be eaten with kichidi ? Your recipe doesn’t say how much water to use….unless I missed it…please clarify; thanks. I loved the recipe! It turned out really tAsty! My entire family loved it! Huge hit in my house 🙂 thank u very muchh! Do you think this would go with pulao as well? thanks for the reply, Alka. I served it with plain rice and aloo took 🙂 I loved the bittersweet taste of cluster beans. Hi Alka, Sindhi kadi is always been a famous dish, never tried it…we make kadhi with onion pakoras in it the authentic punjabi kadhi..will try this out, looks yum!! I would like to make this for 20 people – what is the serving for this recipe – so i can multiply the same? I just need to know how much besan to use . Thanks for the recipe. Haven’t eaten this kadi in awhile. Mmm.. boondi with the kadi reminds me of the ‘langar’ I used to attend in Poona. We also put a little strained tuvar dal into the Sindhi curry. Yes…this so much like the kadhi I made awhile back! My recipe had tamarind as well…but I had no idea it was served with sweet bondi! Is this fried bondi soaked in syrup (sugar/water)? Hi Alka, Was wondering how you would make it in the cooker, till now I just knew that some people make it in the cooker. I was wonder if the bhindi will get over cooked, but I see you added them later. We always boil the tomatoes, gring them and then remove the skin. And do not add tamarind pulp. 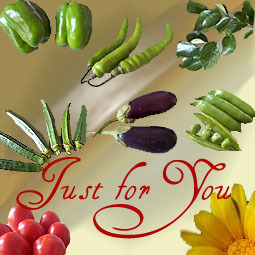 Mom does not even add Kokum flowers I like the addition of Kokum flowers. Sugar gives me the sweet and sour feel.